The staff and students on our deanery campuses use well over 3,000 devices. These are Mac and Windows laptops, tablets, and desktop systems, as well as Google Chromebooks and Android devices. This represents a capital investment by the deanery of over $2 million. 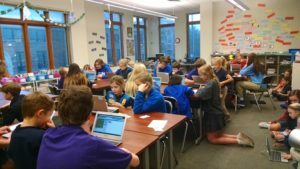 This large investment has been made over the last five years to support 1:1 programs in our schools, providing students with the computing power they need to support their learning. Managing this large inventory of equipment is challenging. First, the lifespan of these devices ranges from two to five years, and then they must be replaced. Equipment breakage rates run from 5-25% annually, and repairs can be expensive. Staff and students need training and support to learn how to use their devices. Decisions about what device to purchase are complex and can be high-profile because of the large costs. Disposal of old equipment must be done in a way that protects the security of any data that may have been on the device. The Tech Office has made this a top focus for strategy development. We have crafted an approach to managing client device programs with our parishes and schools, and can share what we have learned with you. This will help you avoid pitfalls and make well-informed decisions. There are no simple answers when it comes to client devices, and different places will come to different conclusions about their approach. We are here to help you navigate the maze of options and decisions. See our device repair page for more information on our options for fixing broken computers and tablets. We also offer a disposal program for old devices that are ready for retirement.